Old Heraldry For Sale! Act Now! Well, Phooey.... Wait, Maybe Not! The next stop on our heraldic tour was St. Michael's Church in Linlithgow, where we were treated to a very impressive display of Royal heraldry. And at the right, in the fourth panel, Queen Victoria, with the Royal Arms as used in Scotland. I want to discuss a couple of the other panels in this window in the near future, but I wanted to share this impressive display of Royal heraldry with you first. For our last look at the heraldry contained in the church at Abercorn, Scotland, I have saved the best, or at least the largest and most "in your face," for last. I am speaking, of course, of the Hopetoun Loft, a separate enclosure with its own private entrance built behind and above the altar by the Earl of Hopetoun. Here's a closer view, with the achievement of arms sandwiched in between the two pillars of fruit, between two copies of the letter H surmounted by a very large earl's coronet. If you are going to "mark your territory" heraldically, by golly, this is how you do it! Just sayin'. The foliate framing around the upper edge of the front of the Loft has two copies of the arms, one facing the church (top) and the other facing the Loft (bottom), each surmounted by an earl's coronet and supported by, well, I'm not sure what they are. At first blush I thought that they are mermen or mermaids, but closer inspection shows no fish tails, only a continuation of the green foliage. In any event, they are not the supporters found in the full achievement painted on the back wall of the Hopetoun Loft. But, of course, it is that large achievement of arms painted on the back wall that really catches the eye. 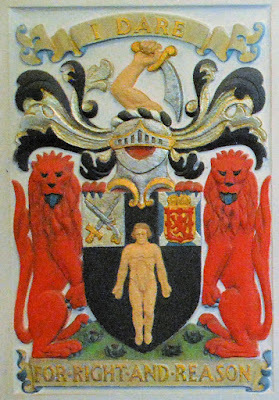 It is the marital arms of Charles Hope, the 1st Earl of Hopetoun, on the dexter (left side of the viewer) side, and his wife, Lady Henrietta Johnstone, daughter of William Johnstone, the 1st Marquess of Annandale, on the sinister side. The Hope and the Johnstone/Johnston families, both coming from the same area and moving in the same social circles, intermarried over the course of several generations, some generations becoming Hope-Johnston and other Hopes taking Johnstone as a middle name. The Hope of Hopetoun arms are blazoned Azure on a chevron or between three bezants a bay leaf slipped vert. The Johnstone of Annandale arms are blazoned Quarterly: 1 and 4, Argent a saltire sable on a chief gules three cushions or (Johnston); 2 and 3, Or an anchor gules (Fairholm of Craigiehall). The shield is surmounted by the coronet of an earl. The crest is the same we have seen in the Hope of Craighall window a few posts ago: A globe fracted at the top under a rainbow with clouds at each end all proper. The supporters are: Two female figures in loose garments hair dishevelled each holding in the exterior hand an anchor all proper. (Again, the anchor is an emblem of hope, and thus cants on the surname.) The motto is At spes infracta (But hope is undaunted), also playing on the surname. In another part of the church at Abercorn, in a narrow alcove where I could not get directly in front of it - hence the angle of the photographs here - was a monument to the memory of the wife of the man memorialized in my last post, Thomas Dalyell of the Binns: Janet, daughter of Edward Bruce, 1st Lord Kinloss. [H]ere Rest The Remaines [of J]anet Brvce, wife of Thomas [Dal]yel of Binns, who when [she] had lived 61 yeeres changed [her] transittorie life with that [bles]sed and eternal the 1 Dec[ember] Anno M DC XXXIIII . The four-line poem is is an epitaph by poet William Drummond. The last line on the memorial, in Latin, speaks of the grief of the husband. But of course it is the coat of arms at the peak of the memorial which attracted me first. The arms here would be blazoned Or a saltire and chief gules on a canton argent a lion rampant azure armed and langued gules. There is a difference, though, which you can see more clearly on the larger photo (click on the photo above to see it), in that the lion on the canton is debruised by a ribband. I am not certain why the ribband is here. 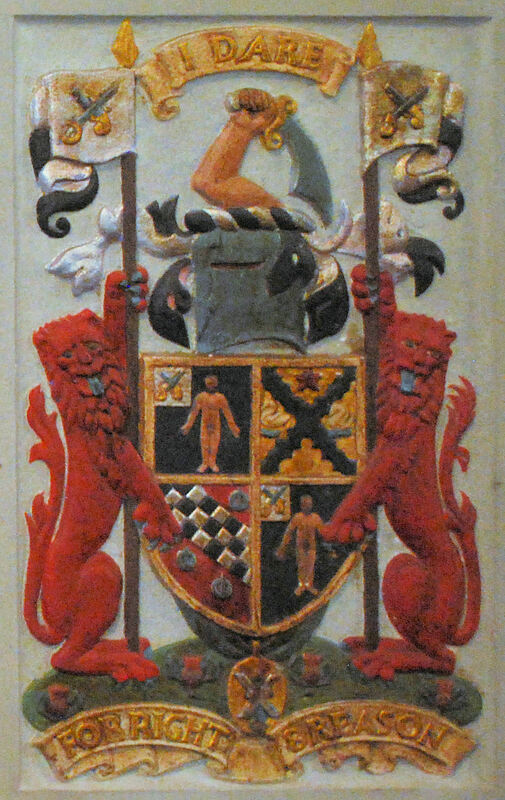 It does not appear on the tomb of her father (https://en.wikipedia.org/wiki/Edward_Bruce,_1st_Lord_Kinloss), nor can I find it in any other Bruce-related arms. And yet, there it is on her memorial here. Like so many other things in life, I guess it's a mystery. Yet how special to see two separate monuments to a husband and wife, both beautifully carved, both armorial, in this old Scottish church in Linlithgow. It is a medallion worn by actor Vincent Price as "Prime Minister" Richelieu in the 1948 movie The Three Musketeers (starring Gene Kelly, Lana Turner, Van Heflin, June Allyson, Frank Morgan, and Angela Lansbury, besides Mr. Price). I was especially interested in it because of a confluence of three factors: heraldry, movie history, and genealogy. First, it's not only heraldry, but it is historically correct heraldry used in a movie. The medallion is the arms of Cardinal Armand Jean du Plessis, Duke of Richelieu and Fronsac, Argent three chevronels gules. (The coronet of sitting atop the shield is not accurate, being the coronet of a French count, not a duke. Still, they used the correct coat of arms in the movie!) So there's that. Second, it's from an old movie, and more specifically, an old costume drama, and people who know me well know that I have an interest in such movies. Indeed, I have a regular monthly movie review, mostly of movies set before the 17th Century (which "definition" has been expanded to include, for example, the various incarnations and remakes of The Three Musketeers) and in pre-technological fantasy worlds (such as The Lord of the Rings, among others). You can find a new movie review each month on my website at http://www.appletonstudios.com/movies2.htm. So there's that. So, naturally enough, with all three of these factors connecting to this one object, I was very interested in acquiring it if I could. 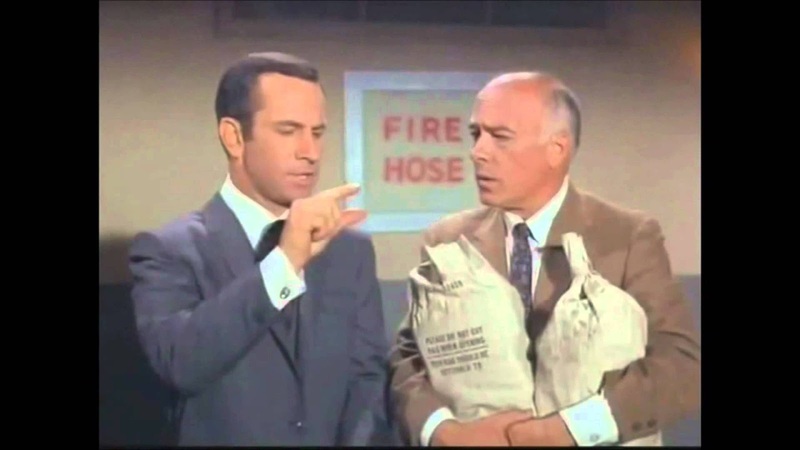 I carefully considered my options, looked at what the auction house estimate was, reviewed my budget, and submitted a bid for a little over the high estimate. Alas, I was informed by email on Saturday that I had been outbid for this medallion. Am I disappointed? Well, yeah, of course. I mean, I have a personal interest and familial connections to this medallion. Am I really upset to have lost out on it? No, because I had submitted the bid that I thought my budget would bear, and I wasn't going to pay so much that I would worry about next week's or next month's groceries. I can only hope that whoever won the bidding on it will put in somewhere in pride of place in his or her collection. I know that I would have. Back in that corner of the church at Abercorn, Scotland, was another monument to another member of the Dalyell of the Binns family. The angels on each side of the banner with the legend appear to be blowing shofars, or ram's horns. But of course, it's the heraldry on top that held the bulk of my attention. The arms are those of the oldest of Dalyell of the Binns, Sable a naked man arms extended proper, in dexter chief a crescent for difference. (A crescent is often seen as the heraldic difference for a second son.) The crest is slightly different from the Dalyells we have seen, being: In dexter hand a sword proper, instead of a scimitar. The motto above the crest, too, is different: Non mihi sed alns (Not for myself, but for the high [God? ]), instead of I dare. It is possible that the crest is a transitional one; the crest of the Dalziel Earls of Carnwath is A dagger erect proper (without being held by a hand). This memorial is a beautiful piece of carving; the helmet and mantling is especially well done and striking, as is the hair of the angels, and it was a pleasure to be able to see it. Deeper into the less traveled portions of the Abercorn Church, we found this beautifully carved heraldic memorial. As you can see, it's carved in deep relief, and is placed there in memory of Sir William Cunningham Cavendish Dalyell, Baronet; his wife, Maria Sampayo (sister of the French minister at Hesse, Anthony Sampayo); their son, Osborne William Dalyell (who predeceased his parents); their daughter, Maria Christina (Dalyell) Taylor; and their other son, Sir Robert Alexander Osborne Dalyell, Baronet. Sir William was the 7th Baronet, succeeding his older brother. Sir Robert was the 8th Baronet. He died unmarried, and the baronetcy became dormant until 1914. Sir William Cunningham Cavendish Dalyell has his own entry on Wikipedia, and you can learn about his naval career and the actions in which he took part during the Napoleonic Wars at https://en.wikipedia.org/wiki/William_Cunningham_Dalyell. But, of course, it's the heraldry that is the reason we're discussing this memorial here. The arm in the crest of the Dalyells of the Binns we looked at in the last post has now become simply A hand holding a scimitar both proper. The motto above the crest is still I dare, but the motto below the shield has lost a word, becoming Right and reason instead of For right and reason. The supporters are more unambiguously Two lions sejant erect (gules armed and langued azure). The badge of a baronet of Nova Scotia depends from a circlet (it is not a belt or garter) bearing the legend Fax mentis honestæ gloria (Honest fame is the torch of the mind). Quarterly: 1 and 4, Or a bend checky sable and argent between three buckles azure (Dalziel of Binns); 2 and 3, Sable a naked man arms extended proper on a canton argent a sword and pistol in saltire proper (Dalziel of Binns); impaling, Quarterly: 1, Azure a cross potent or; 2, Quarterly: i and iv, Or an eagle displayed gules; ii and iii, Checky or and azure; all within a bordure gules charged with eight letters S or; 3, Or six crescents pendant two two and two azure; 4, Azure five fleurs-de-lis two one and two or. 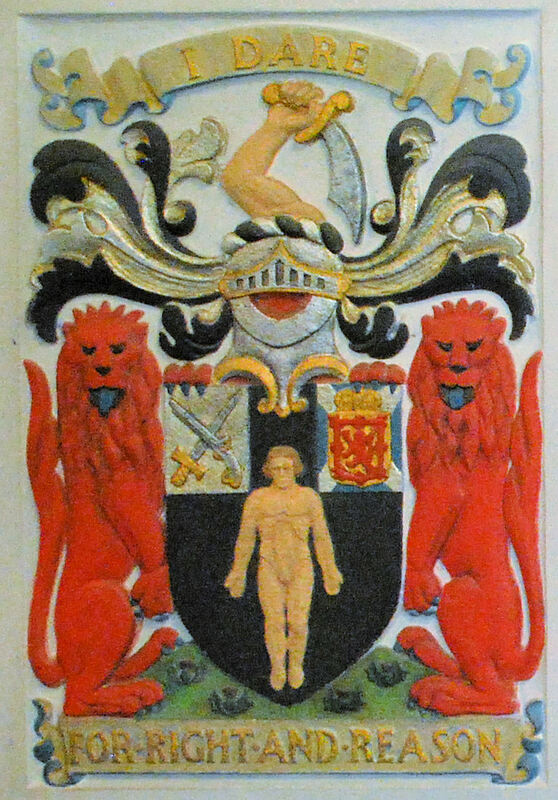 The oddity of have two different quarters, both for Dalziel of Binns, in Sir William's arms comes from the fact of the naked man in the second and third quarters being the first matriculation in 1685 and the checky bend in the first and fourth quarters coming from the second matriculation in 1772, when the quarterly coat here was registered. My take on all this: It's a beautiful memorial to a family with an interesting history. And it includes some great heraldry. Continuing our heraldic tour of Abercorn Church in Scotland, we found two memorial plaques to different members of a family, both of whom had military service, one of whom had been an officer of arms in the Court of the Lord Lyon. One of these plaques was in memory of Sir James Bruce Wilkie Dalyell of the Binns, 9th Baronet, and of his wife, Dame Mary Marjoribanks Robertson. The arms are those of Dalyell of the Binns blazoned above, with a second, sinister canton bearing the badge of a Baronet of Nova Scotia. The crest is A naked arm embowed brandishing a scimitar both proper, with a motto (above the crest) is I dare with a second motto below the compartment (which is a vert mound scattered with thistles proper), For right and reason. The supporters are two lions rampant [or are they really sejant erect?] gardant gules armed and langued azure. The second memorial plaque is for Gordon Dalyell of the Binns, once Unicorn Pursuivant of Arms in the Court of the Lord Lyon. His arms are: Quarterly: 1 and 4, Sable a naked man his arms extended proper on a canton argent a sword and pistol in saltire proper; 2, Or a saltire engrailed sable between two swans naiant in fess undy or in a loch proper, in chief a mullet gules for difference (Loch of Drylaw); 3, Or a bend checky sable and argent between three buckles azure (Dalziel of Binns). The crest is the same as for Sir James, above, as well as the mottos and compartment. The supporters, however, are each bearing a banner of the Dalyell canton. The pendent ribbon and medal of St. Andrew holding his cross are, I assume, for his service to the Crown in the political service and/or as Unicorn Pursuivant (1939-1953). Next time, another monument to another Dalyell. Moving now from the heraldry on the exterior of the church at Abercorn, Scotland, we went inside to find, among other heraldic displays, this large armorial stained glass window. Of course, the part of the window that most attracted me was the achievement of arms at the bottom. For such simple arms, the crest (which is unusual in that it has a torse sitting atop a crest coronet; normally the crest coronet is used in place of the wreath) is a fairly complex one. You can click on the image above to go see the full-size picture, which shows the details of the crest more clearly. It is the arms of Hope of Craighall (first matriculation 1672-7; second matriculation 1780): Azure a chevron or between three bezants. The crest is A broken globe surmounted of a rainbow with clouds at each end proper. The supporters are Two females vested vert winged or on their heads garlands of roses proper each sustaining in her exterior hand an anchor azure. The motto is At spes non fracta (But hope is not lost). The anchors are a common symbol of hope, and the motto, of course, also plays on the surname. The Hopes of Craighall have been Baronets of Nova Scotia since Thomas Hope was created baronet on February 19, 1628. They also use the motto At spec infracta (But hope is undaunted). A news article about heraldry popped up in one of my notifications recently, about the Town Council of Andover, England (the namesake of a town that one of my ancestors helped to found in Massachusetts Bay back in the 1600s) obtaining official permission to use a coat of arms that it has been using for the last seven years. It's an interesting article, and explains that the Town Council, created in 2010, had been using the arms granted to its predecessor, the Andover Borough Council, in 1949. 2. He states specifically that: "Heraldic devices were first used in the 16th century...." So he's only about 500 years off, since heraldry, defined by Garter King of Arms Sir Anthony Wagner as "the systematic use of hereditary devices centred on the shield," began sometime in the 11th century. 3. He states specifically that: "Fines for not registering use of an heraldic device could have been up to £17,000." I have no idea where Mr. Harber got the idea that the College of Arms or anyone else in England could fine anyone for the illegitimate use of arms there, nor does he note where the monetary figure comes from. The Lord Lyon King of Arms is a Scottish judge, and can put some teeth into his orders about the unlawful display of heraldry, but even in Scotland I've not heard of a fine that large. So, as I say, it's an interesting article, but like secret agent Maxwell Smart in the old TV spy spoof series Get Smart, he "missed it by that much." Are you related to the Hewitt or Allen families of Cheshire in England? You might want to try to save this particular piece of heraldic family history. 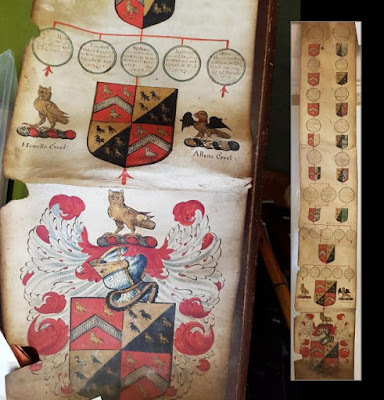 An article today in the Knutsford Guardian discusses the upcoming auction of a 17th Century armorial and genealogical scroll, and notes that Wright Marshall Auction House in Church Hill is looking for descendants of this prominent Cheshire family in the hopes of returning it to the family. Otherwise the scroll will be auctioned on Tuesday, November 7. The picture on the left is of the lowest portion of the scroll, while the inset on the right is of the entire scroll. It covers the history of the family (the Allens from Brindley and the Hewitts from Knutsford and then Northwich) from the time of Edward III up to about 1675. Or, of course, it could be yours if you want it. The auction price is expected to be up to £300. I had high hopes for this one, I really did. And (initially) for nought, apparently. We were still walking about the exterior of Abercorn Church in Abercorn, Scotland, and ran across the following carved coat of arms and crest. But identification of the owner of this heraldry has been a little frustrating. First off, without any colors to go by, trying to identify this particular lion rampant within a bordure would simply take more time than I can give to the task; there are a lot of lions rampant within a bordure. The crest I cannot find anywhere. One would think that a demi-lion gardant issuant from a hurst of oak trees/oak bush, however differently it might be blazoned, wouldn't be that hard to track down. One would be incorrect. I had thought that the motto scroll below the shield might be helpful. It is badly worn, but it is easy to make out the letters S A Y E possibly followed by a Z, which might then be interpreted, assuming that the first two letters, hypothetically E and S, would make the same motto as the family in my last post, Dundas of Duddingston, who used Essayez (Try). And, indeed, I found a couple of other Dundas families - Dundas of Dundas, and Dundas of Arniston - who use a crest of which the one carved here might be a mistake for: A lion's head affronty looking through a bush of oak proper. Both of these branches of the Dundas family used the motto Essayez. A quick search through Burke's General Armory for those two families shows: Dundas of Dundas bearing Argent a lion rampant gules, with no bordure; but Dundas of Arniston bears Argent a lion rampant gules a bordure ermine. So in the end, I think maybe we've solved it. (Something that none of the websites about Abercorn Church were able to do; they spend much more time on a bit of the interior heraldry, which I'll get to in another post, because it really is pretty impressive.) 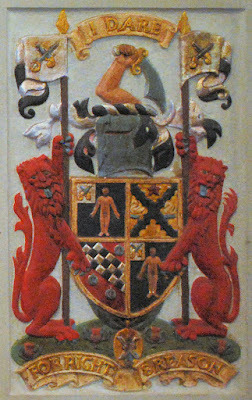 I'm going to commit myself at this point and identify these arms and crest as those of Dundas of Arniston. It was a bit of a long row to hoe, but we finally made it. And isn't that lion (and the mantling) worth that trip?